Long-term care is a must-have policy because it provides coverage from one of the biggest possible expense that a person may have in retirement. Despite realizing its importance and the protection it provides, most people are anxious about buying this policy because of the cost. The good news is long-term care insurance is not a one-size-fits-all product, meaning you can customize its features to fit your needs and budget. If you want to get insured without breaking the bank, here’s how you can make your premiums affordable. Initially, it’s normal to want a policy that will last for the rest of your lifetime. However, a lifetime policy is more expensive than a policy that is set to pay benefits for a specific number of years. Experts say that a three-year benefit duration is usually enough for most people. Meanwhile, a 10-year benefit period is advisable for individuals who have a family history of chronic illness. An elimination period can last from zero to 100 or more days. The longer the elimination period, the lower your premiums will be. However, you need to remember that you need to pay for your care expenses until the elimination period is over. Usually, people sign up for a 90-day elimination period. In fact, one industry study found that more than half of LTCI buyers opted for a waiting period of 90 days. The cost of a long-term care insurance policy is highly dependent on the amount it will pay in benefits. If you want to lessen your premiums, consider reducing your daily benefit amount and just opt to pay out of pocket should your care expenses exceed your benefits. Inflation protection is an essential feature that you shouldn’t forego. This rider keeps your benefits at pace with the price increases of long-term care services. Though it comes at a separate cost, you can still save dollars by choosing the right kind of inflation protection based on your age. If you are purchasing before age 60, it’s advisable to purchase a compound inflation protection. Though this can double your premiums, having your benefits compounded each year provides you with more benefits and helps avoid out-of-pocket payments in the future. Meanwhile, if you’re purchasing at age 60 and above, experts say that a simple inflation protection is enough. Couples can save dollars by sharing their benefits with their spouse through a shared care rider. This feature pools a couple’s individual policies, thus giving both partners an access into the other’s benefits if they exhaust their own benefits and need more coverage. This rider protects couples from out-of-pocket payments and having to re-apply for a new policy, which comes at a possibly higher cost because of age. Age is a major determinant of how much you will pay for LTCI. If you want to get good rates, it’s advisable to purchase this policy while you’re still young, ideally during you’re 50s. Discounts are also given for applicants who buy young and healthy, and this price cut will stay in effect even if you develop conditions as the years pass. Insurance companies have their own pricing system. Two companies can offer the same policy, but with a 90 percent difference in price. That’s why you need to shop around to avoid overspending for a policy. Though you’re on a budget, be wary of too-good-to-be-true rates. You also need to look at a company’s financial strength, claims payment history, and ratings. You need to know that your insurer has the strength to still be in business by the time you need your benefits. 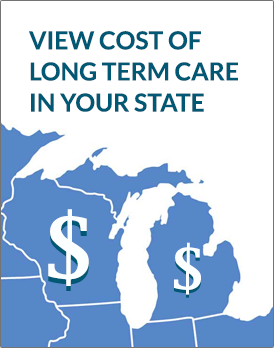 Long-term care insurance comes at a cost, but that doesn’t mean that you can’t afford it. This product is designed to be flexible in order to meet unique needs and different levels of financial strength. All you need to do is determine what to include and exclude in your policy to make it more cost-effective.